Reel Talk Online: DVD Review: "Date Night"
"What are we going to do? We can't go home, we can't go to the police..."
Steve Carrell is usually hit or miss on the big screen. But pair him with funny girl Tina Fey and he could be almost be seen as a riot. In Date Night the two star as a boring married couple from Jersey who try to spice up their life by forgoing their normal date night at their normal steakhouse and hitting the streets of Manhattan to go to a hip new restaurant. But they soon learn that being spontaneous sometimes comes with a price when they steal a no-show couple's reservation at the crowded venue in order to take advantage of the finer food in The Big Apple. The Tripplehorns--as they now have to call themselves--get into a ton of trouble when they learn that the real couple is on the run from mobsters because they have very compromising information. The formerly simple couple who just wanted to try something new now has to find a way to dodge these mobsters and escape with their lives in this slapstick comedy that draws striking similarities to the hilarious 1970 Jack Lemmon flick The Out of Towners. 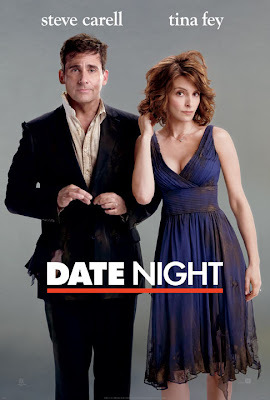 Though silly at times (mostly due to Carrell, as opposed to Fey's dry, witty humor), Date Night is the fun, lighthearted comedy that the two TV heroes needed to reclaim their box office status. Check it out. I loved the scene in the restaurant where they were doing the voices of what other couples were saying to one another! The deleted scenes on YouTube of this scene were funny too.